From left to right: Matthew Wilson, Erin Wilson, Brandon Haines, and Matthew McDonald. The students were chosen through a highly competitive selection process, with over 20,000 student applicants from around the world vying to attend the meetings. 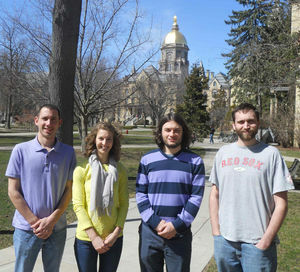 While Notre Dame has sent graduate students to Lindau the past two years (James Clancy, Biology, in 2011, and Catherine Rastovski, Physics, in 2012), 2013 was a banner year with four students selected to participate. Only one other university, Johns Hopkins, sent as many delegates. “Overall, the Lindau experience was exceptional! With the meeting centrally located in Europe, it conveniently brought together many cultures and perspectives on the future of chemistry and science. “I had the opportunity to hear approximately 40 lectures from Nobel Prize winners in just one week. The conference was intense, in terms of the amount of lectures, post-lecture discussions and dinners with individual prize winners, discussions with peers … all of these things not only made me critically evaluate the future of science and chemistry, but also how the projects I’m currently involved with are progressing science. Being a part of such a large group setting can make one really put his or her own chemistry into context. “The Lindau meeting was an awesome opportunity. Every day, different laureates held lectures and individual Q&A sessions where the attendees could ask questions about science, career, or life. The American delegation also had lunches and dinners with various Nobel laureates, including former Secretary of Energy Steven Chu. “Meeting the other students and postdocs probably had the largest impact on me. There were approximately 70 students in the American delegation from all over the country, and more than 80 countries represented from around the world. I hope to keep personal and professional relationships with some of the people I met on the trip. Selection for this year’s Lindau participants is currently underway. The theme of the June 2014 Lindau meetings is physiology or medicine, with August 2014 meetings dedicated to economics. Original story by Stephanie Healey, College of Science website. Originally published by Mary Hendriksen at graduateschool.nd.edu on November 26, 2013.